Seth, aka Yopon Seth, is a handsome 3-year-old blue brindle male born May 18, 2002. 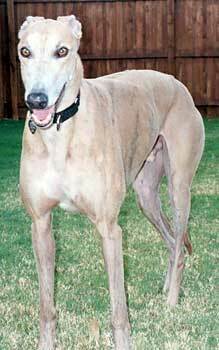 His sire is Gable Cupid, making his grand sire Wigwam Wag, and his dam is Yopon Evita Gun. Seth's racing career encompasses 98 races starting November 15, 2003 in Corpus Christi track in Texas and ending May 6, 2005 in Tucson, AZ. Seth broke a hock that day, finishing his career. He is one of two injured greyhounds of the 49 sent to Texas from the Tucson track, when 3 kennels were abandoned by trainers. Seth was evaluated by Dr. Bob Radasch of the Dallas Veterinary Surgical Center. On August 25 Dr. Radasch performed an evaluation of Seth under anesthesia. What he found was that no gross movement in any of the joint spaces could be identified under fluoroscopy - the fracture of the calcaneus and the central tarsal bone, along with the collapse of the inner tarsal joint space, has healed to the point that surgery, in his opinion, is not recommended to help Seth. Seth does not appear to be in any pain at all from his leg, and he will walk and run on it periodically. Seth truly needs to find his forever couch, and will not be a greyhound that can participate in long walks. It is not known at this time if Seth is small animal or cat tolerant. 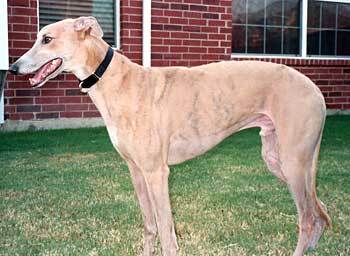 Seth is a light-fawn brindle with an all-over blue shimmer to his coat. He has very soulful amber eyes. What a handsome fellow. He has been very well behaved since the first day he arrived as our foster and was already housetrained when he came to our house. You can definitely say Seth is food motivated -- he is very interested in all things that look like they could be food. We have taught him to wait his turn for treats along with the other three greyhounds. He will sniff the counters if there is food around, but he backs away when told "no" and will go lay down on command while we eat meals. Seth is very sweet and gentle to everyone. He is a bit shy when he first meets new people, but warms up after just a few visits with the new person. Gradually he gives his full trust and shows no shyness at all to the people he has come to know. He plays with toys in the house and likes to stay within sight of people. He will follow us as we move around the house. He likes to be petted and will stand next to you and lean slightly so that you know he is there. During the workday, Seth stays in a crate in the same room with our greyhounds that stay in crates too. When we come home, he is very happy and wants to be petted right away. Then we go outside to take care of business and get petted some more. He likes to rub his face on our legs, almost like he is petting us. We also feed all the dogs in their crates so that we know who is eating and how much each dog is eating. At night Seth sleeps on a dog bed next to our bed. He sleeps quietly through the night with no problem. His right rear leg was injured but is now healed. It does not appear to be too bothersome to him. He plays and runs along with the other dogs. When he moves fast, he holds the leg up and is an expert three-legged greyhound. He has even mastered the stairs in our house. He does not seem to be in pain. Seth is a very patient boy and will allow us to clip his nails with no problem at all. Seth likes to go for walks and uses the injured leg when walking without limping. He walks very nicely right next to us unless he sees a bunny or something he thinks might be a bunny, then he gets very excited and wants to investigate. When we take him in the car he gets in without any help from us. He then lies down and takes a little greyhound nap. Somehow, he always knows when we are almost there, so he stands up to look out the window, getting increasingly excited to get out and meet some new people or hounds. Seth is a gentle angel with a heart of gold. I have referred to him as "the perfect greyhound," but of course other greyhound owners tell me that they have "the perfect greyhound." Visit Seth and see for yourself. He will first melt you with his timid look, and as you get to know him better he will melt you with his wonderful personality.